Committed to providing ultimate consumer experience, Sony announcedtoday its2016 BRAVIA™ 4K HDR line-up.The new 4K HDR models are a true novelty for consumers, adding real value to their 4K TV viewing experience. The 2016 BRAVIA line up boasts of Sony’s 4K HDR technology - a burgeoning video standard that greatly expands the range of possible visual expression by reproducing stunning details never produced before by a 4K TV. Combined with 4K Ultra HD resolution, HDR video content delivers exceptional detail, colour and contrast, with a far wider range of brightness than other video formats. The technology reflects most lifelike picture with brilliant highlights and fine detail. The HDR compatible content and services are now expected to become more prevalent via Internet video services, TV broadcastings and Ultra HD Blu-ray titles. Additionally, the 4K HDR range supports Google’s official Android TV operating systemoffering a unique experience of Sony’s exclusive user interface, exclusive TV apps and a plethora of TV apps & features from GoogleTM. The 2016 range of Sony’s Android TVs additionally delivers features which makes the TV viewing via DTH/STB, an extremely user friendly experience. The upgraded Voice search function enables customers to search their channel names/TV contents without manual typing or remembering the respective channels. The seamless user interface of the Content Barallows a customer to explore other TV contents, internet videos via YouTube or Netflix without disturbing their ongoing TV contents. In addition, all the 4K HDR series (X9350D, X9300D& X8500D Series) are Netflix Recommended TVs, which means customers get the best experience for Netflix .This is attributed to the special features like direct Netflix button on the TV remote, quick app launch and easy navigation and switching between apps and inputs. The 2016 BRAVIA Series also introducesSony’s new and exquisite design concept- ‘Slice of Living’whichencapsulatesthe designthat feels at home and merges with the overall surroundings. 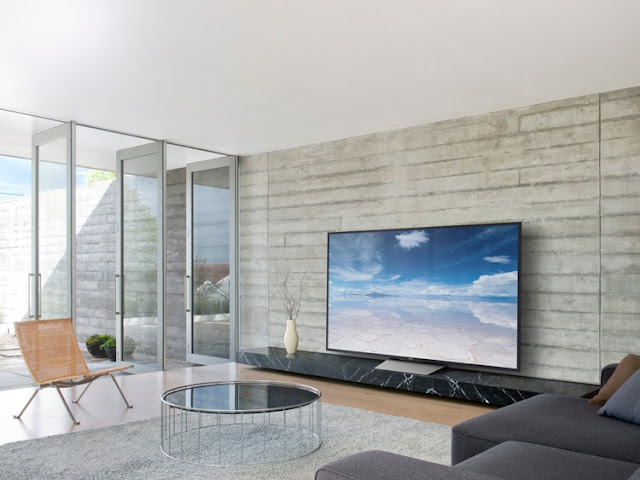 Structurally simple, 2016 BRAVIA TVs resonate with living room design as they are recomposed of slate shapes that seem sliced from walls or the floor and screens that recall pictures or windows. Free of distracting elements, TVs across the lineup have the ability to route the cables through the stand, thereby concealing it from view on all sides. With this Sony aims to set a new standard in elegant TV design maintaining the harmony of a living room while still making a statement. The BRAVIA X9350D Series establishes itself as the Sony’s flagship model in the 4K HDR series.The series boasts of the best picture and sound experience for the customers making it the stand alone choice for any customer wanting to purchase a TV with the ultimate viewing experience. For the stunning picture quality, this TV pairs the brilliance of 4K clarity with the brightness, color and detail of High Dynamic Range (HDR).Powered with Sony’s unique technologies-4K Processor X1, 4K X-Reality PRO, TriluminosDisplayTM&X-tended Dynamic RangeTM, the TV performs thousands of adjustments every second to dynamically enhance resolution, colour and brightness, taking every scene to the vividness of 4K and beyond. The new master piece from Sony is a perfect amalgamation of world class technology and luxurious design aimed to uplift the TV viewing experience.The BRAVIA X9300D is a 4K HDR television offering breathtaking picture quality in a super thin design. The Slim backlight drive with X-tended Dynamic Range PROTMreproduces a far wider brightness range than a conventional LED TV with brighter peaks and deeper, more revealing shadow detail and blacks. When combined with an HDR signal, experience even greater brilliance in every scene as it increases the quality of HDR with finely-gradated bands of colour, more vibrant colours& details all thanks to 4K Processor X1, 4K X-Reality PRO, TriluminosDisplayTM. The BRAVIA X9300D draws inspiration from the ‘Slice of Living’ design concept and comes with clever cable management keeping the wires out of view and mounts it close on the wall like a picture frame. The sleek, flat bezel accentuated with a Champagne Gold stripcreates a visual link between all sides, framing and emphasising the ultra-slim nature of the TV. The beautiful design the X9300D boasts an elegant, tapered front plate that lifts and angles the TV to create a sense of lightness while also ensuring stability. Finished in aluminium, the warm silver tone of the stand perfectly complements both the TV and living space. The sound is enhanced with ClearAudio+ which fine-tunes TV sound for an immersiveexperience.Hear music, dialogue and surround effects with greater clarity and separation. Also, with Digital Sound Enhancement Engine (DSEE) technology, lost frequency components (especially high frequencies) are restored for natural sound with a more spacious feel. The picture quality of this series is a treat for the eyes and delivers an amazing 4K HDR experience with 4K Processor X1, 4K X-Reality PRO &TriluminosDisplayTM.The series sets a benchmark in the entry level range of 4K TVs available in the Indian market by creating a remarkable TV viewing experience with the best of clarity, colour, contrast and more. The sound is enhanced with ClearAudio+ which fine-tunes TV sound for immersive experience.Hear music, dialogue and surround effects with greater clarity and separation. Also, with Digital Sound Enhancement Engine (DSEE) technology, lost frequency components (especially high frequencies) are restored for natural sound with a more spacious feel. Sony India is one of the most recognised consumer electronics brand in the country with a reputation for new age technology, digital concepts and excellent after sales service. The company has its footprint across all major towns and cities through a distribution network comprising of over 20,000 dealers and distributors, more than 300 exclusive Sony outlets and 25 branch locations. Sony India also has 365 service outlets. Manned by customer friendly and informed sales persons, Sony Centers are fast becoming the most visible face of the company. A distinctive feature of Sony’s service is highly- motivated and well-trained staff that provides attentive and sensitive service. Netflix Recommended TV is an evaluation program that recognizes TVs that offer better performance, easier app access, and new features that make for a better smart TV. Visit netflix.com/recommended TV for more information.